The R-Series includes maintenance-free bushings and sealed wheel bearings to improve equipment uptime. John Deere has announced that it is introducing a new family of rotary cutters with a variety of working widths and configurations. Between September 18th and 20th, the 2018 Farm Science Review will take place at the Molly Caren Agricultural Center. Tickets can either be purchased online at fsr.osu.edu or at the gate. John Deere has announced the new 204L and 304L compact wheel loaders specifically designed to increase uptime and deliver higher productivity to customers. John Deere has introduced HarvestLab™ 3000, a new solution to help beef and dairy producers monitor forage constituents at harvest. John Deere has revealed the new 1910G Forwarder, which will be the largest forwarder the company has offered to date. John Deere has announced that its 950K PAT Crawler Dozer is now available at dealers across North America. 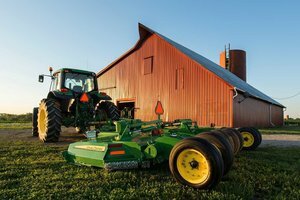 John Deere has announced that it has expanded its line of Worksite Pro attachments with a focus on the agriculture industry. Deere & Company has announced that it will acquire Wirtgen Group, an international company focused on producing road construction equipment.